Who doesn't like to look great at the beach! We all do but this pretty girl needs some help. Make your day by making her look good. 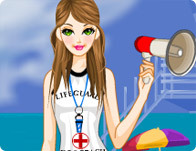 Dress this cool life guard on a sunny beach and keep your swimmer safe! Nothing is more pleasant than go out with your best friends, in a sunny day! Mix and match cool Hawaiian style clothing while you bake in the sun! Did you know that volleyball is a great means to stay in shape and to show off some super chic sporty outfits? It's summer and its time for this fun doll to go to the beach! Choose the right clothes for a fun day playing beach volleyball! Choose fancy dresses and makeup for an exotic ocean party! Beach, Load up the car because it's time for some fun in the sun! With the sand between your toes and the sun in your face, your stunning bikini blowing the girls and guys into outer space! 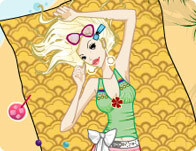 You know style and you love summer, so the Beach games at GirlGames are a great way to show off your summer style. Pick out some cool clothes for the coastline as you swim, surf, and sail all day long! You'll always find the cool games at Girl Games, we have all the best games from game developers like i-dressup, girlsgogames and cartoon doll emporium so you will never get bored! This month we have some amazing games like Sunshine Honeymoon , Turtle Pet and Sun Bathing in Giza. New games are added every Thursday, so check back for all the latest free games online!